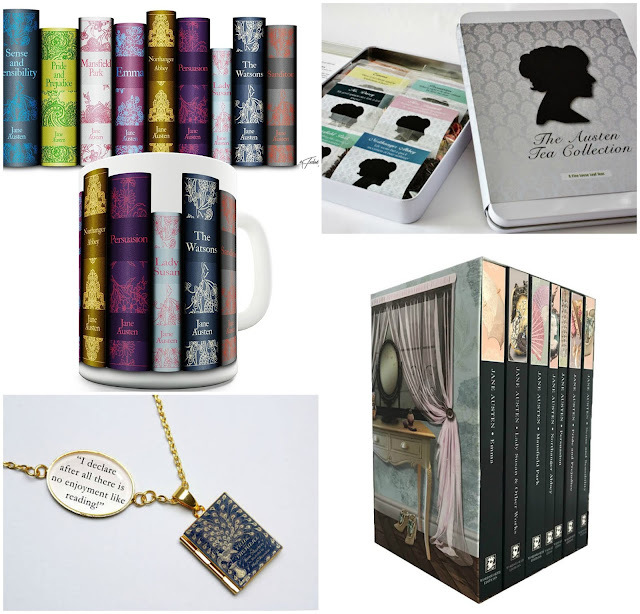 Enter this international giveaway for a chance to win a Jane Austen mug, tea blended by Rosie Lea Tea, a necklace made by The Locket Library and books. Good luck! "What do you like the most about romantic classics and why?" I like the romantic classics, because literary romance needs sass as well as sweetness! I love visiting the periods and places and how the romances play out. I love the authenticity of the surroundings and behaviour and thinking - it's hard to get in the head of people who lived in a different era, it was a different world! I love how they have no modern conveniences to distract them . I love the settings, the language use and beautiful descriptions of places and outfits and how romance develops. Romantic classics offer excellent storytelling, beautiful descriptive language and well developed characters, along with a glimpse into the manners, politics and philosophy of the past that is less accessible through non-fiction history books. There's just something attractive and intriguing about a book that has stood the test of time and offers a clean, and time-tested look into history and storytelling. I like to learn about the past and how people lived and dressed. I enjoy the simplicity of the characters lives. Their lives don't have rushed pace of modern life. I love reading the differences from how life usually is! Escapism at its best. That they are timeless stories. You can somewhat relate in any period of history. I agree, Romantic Classics can be re-read and enjoyed many times. Great writing and memorable characters. I like that they're clean! I love the courtship and conversation! What do you like the most about romantic classics and why? The cultural differences, the descriptive narrative, the construction of the characters. I love how simple their lives were, without all the modern day distractions we have now. It's fun to escape from it all for a little while. Austen is my favourite of all classics! I love how life was so different before technology. I love the language and how people were back then. The classics are so well written. I enjoy the character banter. I like to see the changes and differences between courtship then and now. I like the angst before the first kiss. Forget all the hardships of life and loose myself in a great book. I love the different eras that they are set in and the male chivalry. I like the plot and setting or background in Romantic Classic, because they give me insight about norm, common point of view, how people living at that time (at the story's time setting or when book is written). It's simply interesting and i get to learn something. Better if the story has detailed description about place, architecture or fashion, or world building. It's simply fascinating. I haven't read many romantic classics: Only Pride and Prejudice and Wuthering Heights. I didn't like P&P and quite enjoyed WH. I'd be interested in reading more and seeing what my opinions would be. The innocence. I can't quite explain it. Those time were different and I love to read about it. What I like the most about romantic classics is that they are much more realistic than many romance books today; also, I just love historical fiction in general! I them because they take place in a more innocent era and I can lose myself in the book. Brings me back to when gentlemen used to carry ladies bags, open doors for ladies and generally "look" after them. Seems to be missing in modern-day real-life. The costumes are lovely and the idea of living i one of the large manor houses sounds great, although I'd probably be a servant not a lady. Simple life, simple story and the slow paced days in them. I love the setting, the classic stories transport you to a different time and that's amazing!